I had another tap on the shoulder by the Chinese astral world today. The first one I got was when I was on the phone a few weeks ago with a really good friend who has settled in Shangai. Over the past few years we had a couple of conversations and almost each time I would tease him about the dictatorship he lives in (oh, you can’t access facebook from home? Haha, what a lovely country this is!). All my little remarks stemmed from a resentment that I built when I discovered what happened in Tibet, mainly through Martin Scorcese’s gorgous biography of the Dalai Lama (Kundun), which was so emotional for me that when I came out of the theatre I was ready to throw everything away and help the Tibetan people in India. I did not, and instead went to work in Canada for three years and, oh surprise, found a home which turned up to be next door to a Tibetan Buddhist centre (…into which I was introduced by the very same friend who now lives in Shanghai! Fascinating how clever the universe works!). It was a very important step in my spiritual journey (and the Buddhist temple led me to Assisi afterwards – but that is another story). Anyway, my resentment against the Government of China was steady. And lately, I am sorry to say that it had extended to the Chinese people, as I was hearing the weirdest things coming out of the mouth of some young Chinese people, like : The Dalai Lama has connections to the CIA. Hello! As it turned out I was not able of the same forgiveness! And there was fear as well! Fear of the big giant wanting to conquer the world, of the environmental disaster that a huge country making its way to live like we do. And so on. So I said to my friend: « Okay, I’m going to come and check it out. » That’s right, I am going to visit Shanghai this year and make my own opinion. Now I have been to China before, twice in the 90’s, but that was before I knew anything about Tibet (certainly no history teacher of mine told us the story of that genocide; we got to copy agriculture maps of China instead! ), and it was such a huge experience to process: the ancient buildings being destroyed to make room for modern skyscrapers built to quickly to stand time, the bicycles occupying 2/3 of the roads, the people fighting to buy a train ticket…my stays were too short to allow me to grasp the country fully (if it is ever possible). The second tap on the shoulder as at an exhibition in London where there was an installation by contemporary artist Isaac Julien called Ten Thousand Waves. You enter in a dark room where 9 screens are hanging in mid-air and are displaying a…9-screens film. It lasts 55mn. You move around or choose a viewpoint and witness the stories. When I came in, a beautiful Chinese goddess was flying in the air. I was hooked. 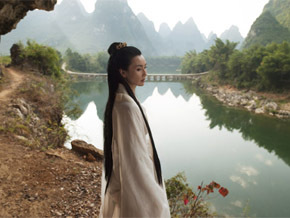 And another door opened in my mind, allowing the myths of ancient China in, and the recognition that Asian culture has had movies and TV series featuring nature spirits, ghosts, angels and gods interacting with human beings for such a long time! Yes it is cheesy to our eyes but hey: those entities that we are slowly learning to see, hear, perceive, channel, talk to, they are, in my view, much more « mainstream » in Asia than in the Western world! I imagine that everyone over there knows about them, even if they don’t all believe in them. Try and ask a Wall Street executive if he knows about nature spirits! Now, I know the graphics are appallingly cheesy. This sequence probably comes out of some video game (hopefully) or a series (hard to swallow if you’ve worked in computer graphics like I have) or a movie (I’d rather not). But, the third door that opened is actually one of humility. I think we can become a bit self-conscious when we are engaged in the whole building the New Earth paradigm (doing my best not to call it New Age here!) as a lot of it seems to emanate from the USA or Europe (with optional extensions to Iceland). The truth is we are only just catching up on perceiving our bodies as a tool to feel energies, and more, work with them. Tai Chi practitioners have been doing that for centuries. To sum up: what opened up fo me and which replaced my suspicion of anything Chinese is the perception that there is a huge wealth of knowledge and information available to us in this part of the world, and, although I am not blind either to the environmental disasters taking place or getting ready to explode in China nor to the manipulation that the party in power is subjecting its population to, I feel it is crucial to focus on the positive sides of this culture coming more strongly across the world, if we are to maintain a balanced heart in the times we are living in.